A new MACH-Air™ controller is now shipping from Reliable Controls®. The new MACH-Air™ utilizes an enhanced brushless Halomo motor technology that is superior to brush technology, allowing for longer-lasting life. The Halomo motor inherently provides precision revolution counting for motor positioning with a resolution of 1/84 of one degree. In addition to the Halomo technology, the new MACH-Air™ has an enhanced sample program for smoother VAV control and a jumper selection switch to configure triac outputs to be two position or tri-state. 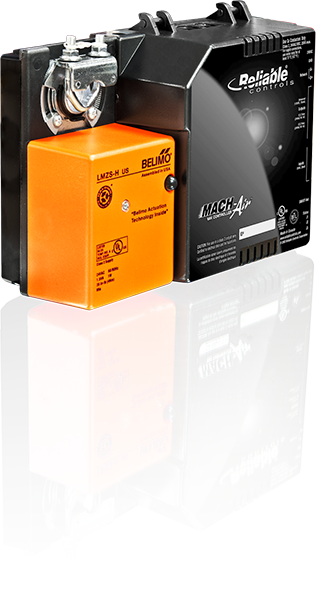 The MACH-Air™ ships standard with BTL, and UL certifications and an industry recognized 5-year warranty. Another simple, flexible and economical solution from Reliable Controls.